Lorena Lopez, human development and family sciences senior, lives at The Ballpark Apartments, located in Riverside. Lopez saw Riverside as an affordable alternative to West Campus. Editor’s Note: This is the second piece in a two-part series of stories examining the affordable housing options available to students looking to live in West Campus. The first part ran Thursday. When Lorena Lopez was 16, she came to Austin for a music competition. She remembers seeing the campus for the first time and being shocked by its size; her hometown, El Paso, was not as amazing as this city. Looking back, she cannot believe how awed she was by the size of UT. Lopez started at UT three years ago, intent on becoming a doctor. The senior has changed her mind since then — she is staying an extra year to finish up a human development and family sciences degree. She works at the YMCA taking care of kids, and wants to pursue a career where she can work with children. Her salary isn’t bad, but she said she doesn’t really rely on the job; her scholarships and grants take care of most of her expenses. Lopez lives in The Ballpark Apartments, a large complex in Riverside, a student housing community south of Interstate 35. 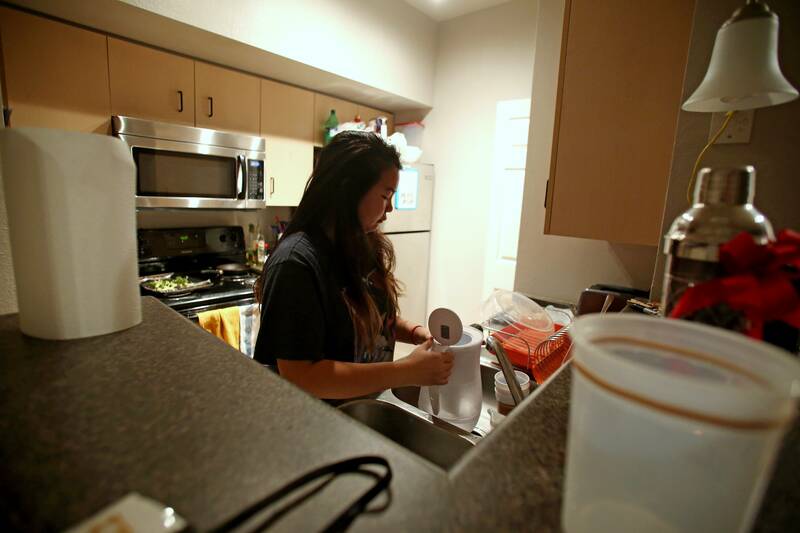 She started looking for housing in West Campus, but realized most of the options within her price range were unfurnished — being from El Paso, having a furnished apartment was a priority. 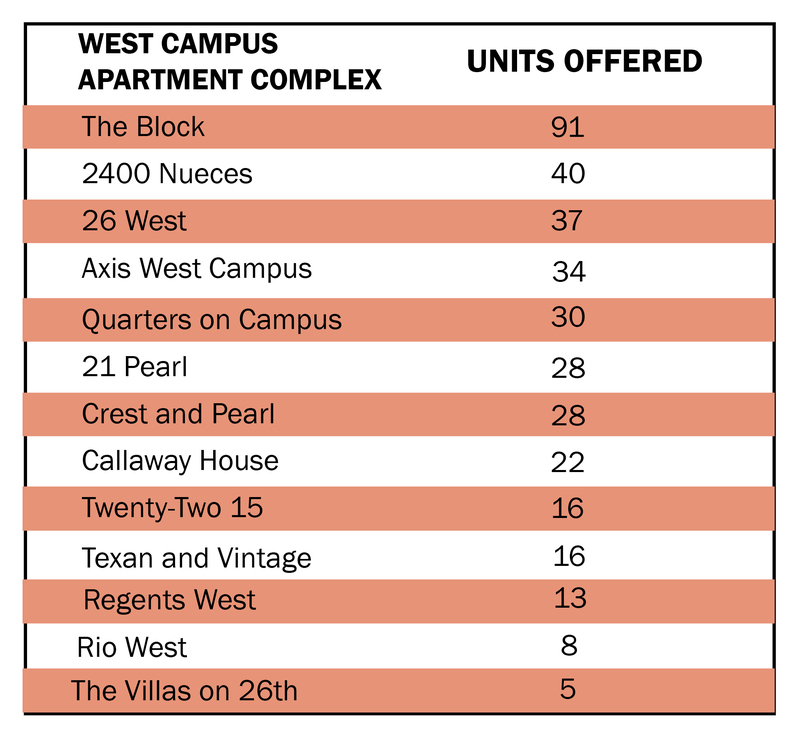 In an attempt to offset the rising costs of West Campus, the city of Austin wrote the University Neighborhood Overlay (UNO) ordinance, which calls for developers within the area to make a minimum of 10 percent of their units affordable housing and require them to pay a fee in order to opt out of providing more than 10 percent. Affordable housing in Austin is called “S.M.A.R.T. Housing,” which stands for safe, mixed-income, accessible, reasonably priced and transit-oriented housing. Gina Copic, the real estate and development manager for the Neighborhood Housing and Community Development of the City of Austin, oversees the incentives that power the S.M.A.R.T. Housing program. Requiring affordable housing is prohibited by state law, so the city came up with a program to encourage developers to provide affordable housing, Gina Copic said. Incentives to provide S.M.A.R.T Housing include flexible regulations on height and parking. Developers do not have to participate, Copic said. Marketing senior Kara Simmang is currently studying abroad in New Zealand, but plans to return to her S.M.A.R.T. Housing unit, which she has been subleasing, next semester. She pays $616 for a one-bedroom unit normally priced at around $1,000. It can technically be labeled as affordable, she said, but it depends on who you’re asking. Staying close to campus is a priority for many students, including Simmang and journalism and political communications senior Luqman Adeniyi, who pays $959 for his one-bedroom at 26 West. The same unit, without S.M.A.R.T. Housing designation, rents for $1,439 a month. The rates have increased significantly in recent years — in 2012, the same apartment at 26 West rented for $1,209. The University ranked 40th out of 179 top American colleges in affordability, but finding affordably priced housing has become a challenge for students. Even ignoring the fact that UT does not provide enough beds to house students on campus, dorm rooms at the University cost at least $9,757 during the 2015-2016 school year, which works out to roughly $1,064 a month (including a meal plan). Students can qualify for S.M.A.R.T. Housing within the UNO district through certain kinds of financial aid and scholarships. Fifty percent of UT students receive financial aid, and the University gave out $360,726,238 last year in assistance, according to the Office of Financial Aid. But with so few S.M.A.R.T. Housing units available in West Campus, this does not guarantee many students discounted housing near campus. Of the 13 apartment complexes that do offer S.M.A.R.T. Housing, three have sold out of S.M.A.R.T. Housing, and six are still waiting for their current residents to renew leases before opening up units to other potential renters. It is difficult to get S.M.A.R.T. Housing because most people renew their leases. Crest at Pearl has 28 S.M.A.R.T. Housing units, and they all sold out before November, according to property manager Eric Lopez. Sociology senior Crystal Nuñez lives in Town Lake Apartments, on Pleasant Valley Road. She said she prefers the homey feel of Riverside to the West Campus culture, which she feels is saturated by constant frat parties, noise and garbage. Lorena Lopez agrees. Nuñez wanted to move from Jester East to West Campus her sophomore year. She moved into Axis West, where she paid the regular $785 a month for her own room, not including utilities or parking. Her total living expenses averaged $1,000 each month, and after a few months of juggling her school schedule and a heavy workload at Taco Bell, she decided to move on. While Riverside and North Campus are both much more inexpensive areas, Adeniyi said he prioritized living in West Campus because he often stays on campus late into the night for various organizations he is involved in. He renewed his lease to stay another year, even though the rent increased by $30 a month. “Although the cost is still high for a single unit, compared to other options, it is worth it to me,” Adeniyi said.